Does the winter blues have you down? Outdoor family time can get difficult during the winter. Maybe you should start snowshoeing on the weekends. Snowshoeing is one of the easiest and least expensive winter sports out there. It’s a fun and easy activity perfect for the whole family. Unlike skiing and snowboarding, your kids don’t even have to be athletic to take up snowshoeing. Families can enjoy snowy days without having to buy an expensive ski pass and all that gear. All you really need is a cheap pair of snowshoes and warm winter clothing. Unlike most winter sports snowshoeing doesn’t take much athleticism to get started. If your kids can walk they can probably figure out how to go snowshoeing. Obviously you don’t want to force your 1 year old to walk through the snow. Once a child reaches 3-4 years old they should be able to figure out how to use snowshoes. There’s going to be learning pains, but they’ll learn faster than you would ever think possible. Rent or Buy Kids Snowshoes? For adults renting snowshoes is a great entry into the sport, but this really doesn’t make much sense for children. Youth snowshoes really aren’t all that expensive when you compare them to adult snowshoes. Youth snowshoes typically cost somewhere between $30-70. Rentals will typically cost at least $20 bucks so it doesn’t make much sense. Instead buy a pair of snowshoes that are only designed to last a few years. Just like with regular shoes your child will probably outgrow their snowshoes in a few years. Luckily kids shoes aren’t all that expensive since they aren’t designed to last more than a few seasons. Choosing kids snowshoes isn’t as straight forward as it is with adults. 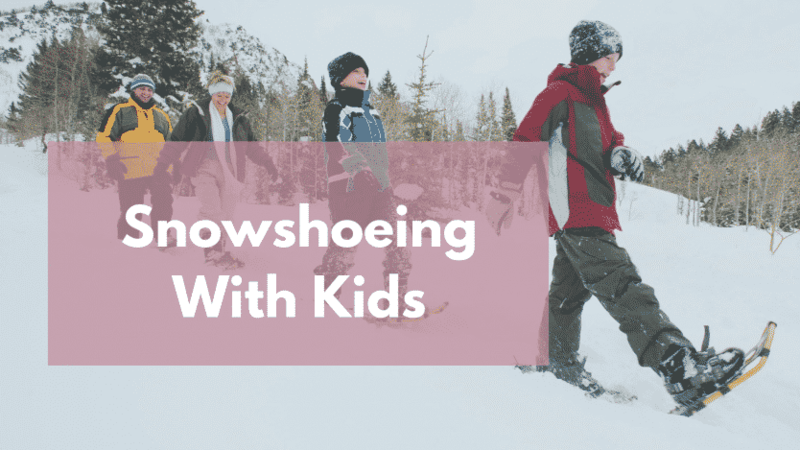 Kids outgrow their snowshoes quickly so it doesn’t make sense to spend a lot of money. If a kid can walk, there’s probably a pair of snowshoes that will fit them. Here are a few of my favorite brands for young children. Kids snowshoe bindings are typically designed to be used on a wide range of snowshoes. Before buying make sure the bindings are going to fit the kids shoes. Just like with adult snowshoes, the size you need is based on the child’s weight. Heavier children are going to need a larger surface area to support their weight. Using a snowshoe that doesn’t properly fit the kid will make their feet sink deeper into the snow. It’s always going to be better to go one size bigger than a kid actually needs. They might need to use a wider stance to accommodate bigger shoes, but they’ll quickly grow into them. You shouldn’t expect toddlers to put on their own snowshoes, but a 4+ year should be able to get on his own shoes. Try to find snowshoes that have bindings that are easy to put on, adjust and take off. Snowshoeing with children should involve just as much fun as exercise. Your kids are going to be running around so try not to force them to overdress. During the winter I was more likely to get heat stroke as a child than hypothermia. I was like that little kid in the Christmas Story that couldn’t move. 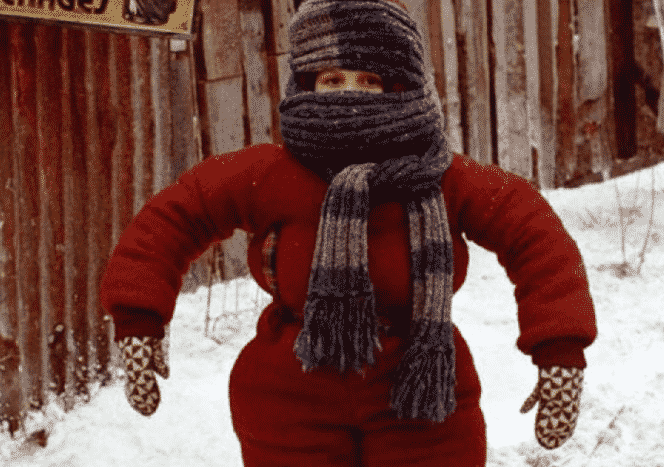 Instead of going with a single large winter jacket you should layer winter clothing. Throughout the day temperature levels are going to rise and fall. Keeping your kids warm, dry and comfortable isn’t an easy task when they’re out running around. Start off with lots of layers and they’ll slowly ditch them throughout the day. Overtime you’ll find the right balance of warmth and comfort. Just make sure you get the kids attention and keep asking if they’re cold. Jackets: Look for a lightweight waterproof shell jacket that isn’t going to be too warm on those moderately cold days. Check out the Columbia Jackets that are designed for skiing/snowboarding. Make sure the jacket isn’t overly insulated. Goose down is typically much too warm for extended snowshoeing trips. Snow Pants: Once again I would probably go with lightweight waterproof skiing/snowboarding pants. Columbia and Burton both make great products, but they can be a bit pricey. Insulated Layers: If you wear lightweight outer layers you’ll need insulated layers. Personally, I like synthetic moisture-wicking fabrics that stick tight to the skin(think along the lines of Under Armour). Just don’t go with cotton, because it will be soaking wet by the end of the day. Thick Socks: Whatever you do don’t wear cotton socks. Only go with thick wool/synthetic materials that wick away moisture. Look for hiking socks marketed towards children. Other Accessories: Obviously, you don’t want to forget gloves, winter hats, water bottles and snacks. Kids can even carry a small pack to haul out their extra clothes. Every pair of youth snowshoes that I’ve ever seen is one size fits all. I would probably go with the MSR Childrens Snowshoes for children under 5 and the 19″ Chinook Snowshoes for children under 10. It really doesn’t matter how big a child’s foot is. You can adjust the bindings to accommodate any foot size as the child grows. Foot size doesn’t matter, sizing depends on the weight of the child. Just make sure you don’t overly tighten the straps, they should be snug without cutting off circulation. Heavier kids need wider/longer snowshoes to evenly distribute the weight. Once a child reaches 80lbs ditch the cheap childrens snowshoes and trade them in for women’s models. Snowshoe bindings are big enough to accommodate any shoe size. Your best bet is going to be lightweight winter boots, but you can also go with hiking boots or regular sneakers. Just make sure the boots have a flexible ankle and excellent waterproofing. What works for adults isn’t going to work for children. They’ll be running around, playing in the snow and doing things adults won’t. You might not get water into your boots, but your kids will. That’s where gaiters come in. Gaiters create a waterproof seal between your boots and the bottom of your pants. Very few companies make gaiters specifically designed for kids so you’re better off going to your local sporting goods store during the winter. Do You Need SnowShoe Poles? Honestly I don’t think that kids actually need snowshoe poles. Just about anybody can go snowshoeing without poles. Unless you’re traversing tough terrain which I don’t recommend you won’t need poles. Snowshoes are big and awkward for children due to their size. They tend to uncomfortably walk with their legs spread and feet pointed out. Almost looks like a penguins waddle. Teach young kids to walk with their feet pointed forward and legs together. If the shoes are slightly too large don’t worry they’ll grow into them soon enough. It’s always better to have snowshoes that are too large than small. Snowshoeing is Easy: It really isn’t all that difficult to learn how to use snowshoes. If your kids can walk they’ll be able to learn within a couple minutes. Practice at Home: Unless your renting gear you’re going to want to practice in your own backyard. Practice putting on the shoes and taking them off at home. Teach your kids how to adjust the bindings, walk forward and turn. Go On Hills: Snowshoes are better at traversing uphill than down. Once your child can walk on flat ground take them to a small hill. They’re going to have to pick up their legs higher so they plant squarely on the ground. Plan Your Route: Before heading out onto the trail make sure you plan the route. Make sure you consider the child’s age before planning the trip. Younger kids aren’t going to handle longer trips. Stick to Snowshoe Trails: When going down trails try not to disturb ski trails. Take Extra Breaks: When I go out snowshoeing is all about exercise and spending time in nature. Your kids don’t care about exercise! Make sure you schedule lots of breaks so they can play in the snow. Manage Your Expectations: Doesn’t matter what activity you’re doing it’s always fun to see your kids excel. Snowshoeing turns a boring walk into a fun trip, but try to manage your expectations. Be patient while kids learn and keep your trip short. Plan ahead and make sure you bring along plenty of snacks and water. Don’t forget a thermos of hot chocolate for when your child gets cranky. Trust me, with all that exercise there’s going to be tears by the end of the day. Once you start to see that switch flip it’s the perfect time to slow down and bring out the snacks. After your snack/lunch break it’s the perfect time to play in the snow and have a fun time. Just make sure you do a quick gear trip and everything is accounted for. With so many layers it’s a serious pain to strip down and make a bathroom trip. Try to be smart when you’re planning bathroom breaks. Go whenever it’s easiest and be ready for the inevitable pee break along the trail. I swear my kids purposely wait so they can pee in the woods. Before leaving for the trail double check and make sure you bring along some toilet paper just in case. Just make sure you follow the leave no trace policies and pack out your toilet paper. Hiking in a Dress: Are Hiking Dresses Really Comfortable?